Last month Janssen threw me a lovely little birthday party at her house. Not only did she make a fantastic salad for lunch but she also gave me The Curated Closet by Anuschka Rees. I was really excited to read it but honestly didn't realize how much I needed this book until I read the first few pages. She talks about having a closet full of clothes and nothing to wear and I was like, holy cow I'm back there, aren't I. See, I first started this blog in 2010 to help me get my clothing groove back after my second child was born. 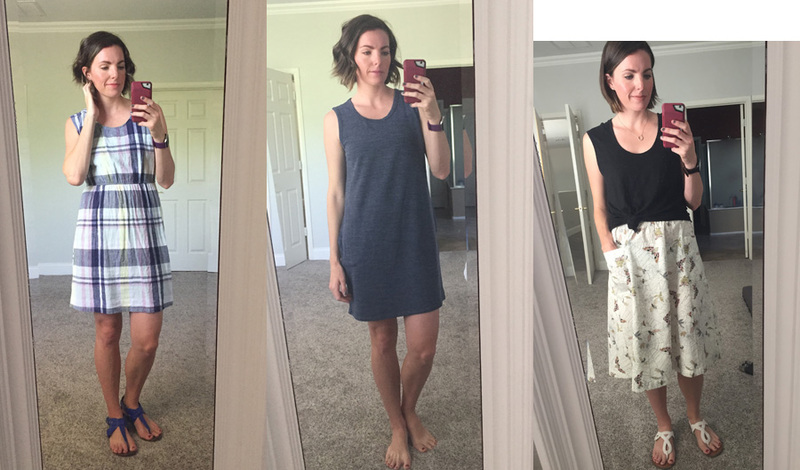 Style blogging felt vain and a bit silly but it was SO useful when it came to nailing down what I liked and what I didn't and working with a body that had changed twice in the previous three years. By the time I got pregnant with baby number 3 in 2014 I knew my style and, thanks to how consistently I wore "me" pieces, so did other people. Friends would send me pictures of shirts in stores and be like, "This is such a Kayla shirt!" and I'd be like, THAT TOTALLY IS and then sometimes I'd go buy it. But somewhere in the past three years I lost that. My body changed even more after having our little Caboose and I find myself turning my nose up at items in my closet that I used to love. Because I wasn't taking regular pictures of my clothing I stopped putting much effort into styling my outfits and they became super basic. Not that there's anything wrong with super basic! But that's not me, you know? Thanks to my regular gym-going I've become one of those people who wears active-wear most places just because it's the easiest stuff in my closet. I get home from the gym, shower, and put on clean gym clothes because anything else has started feeling a bit stressful. 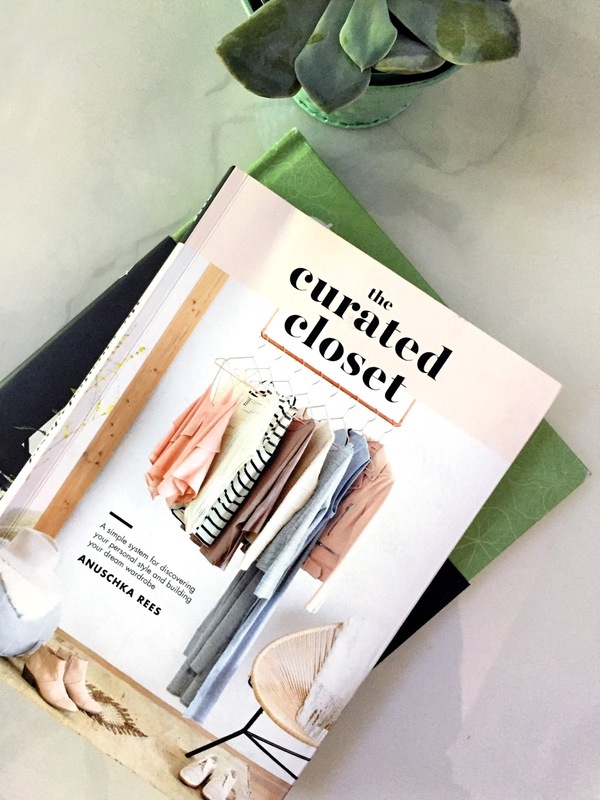 Enter: The Curated Closet. I felt like I shouldn't need it after so many years of style blogging but it seemed more like gentle reminders to do things I already know how to do but have forgotten. Like take pictures of my outfits every day and assess (verdict: I still like a lot of dresses and skirts this time of year. If I had taken pics 3 months ago it would have been allll joggers). Use Pinterest to gather inspiration pictures for what you WANT to wear (you can see my board here). The center top pic is one I came back to again and again. I LOVE that oufit and that's exactly what I want to wear all summer long. The one directly underneath it I managed to pin two different images of the same outfit so I must be really into it. I also pinned a lot of pleated skirts even though I don't particularly love pleated skirts- there's just some good styling on display with those pleats. Ok this is supposed to be a gif that flashes to the white tops, sneakers, and leather jackets. But it only seems to be working sometimes so just know that it looked REAL fancy when I put it together. I was actually shocked by how many basic white tees and button downs showed up in my inspiration pictures. Guess how many basic whites I own? One. I used to have a really great white button down but it was looking sad after many many wears and I finally got rid of it last year. It looks like it's time to get some new basic white tops (I've got my eye on some of Everlane's stuff. They've added so much good stuff in the past few years and I've loved their tees in the past). Shoes are currently a big problem area in my closet. My feet grew a bit while pregnant with the Caboose and shoes that I used to rely on no longer fit comfortably. I've hung on to them because...maybe they'll fit again someday? I don't know. But it's time to say goodbye and look for a couple pairs of non-gym sneakers (chucks are too narrow for me...maybe Vans? ), a cool pair of flats and some interesting (but easy!) sandals. Lastly, I would like a lightweight leather jacket. I actually already own a real leather jacket but A. it's brown and I think I want black and B. it's REALLY warm. I wear it about twice a year, usually in the depths of December. So I'm going to keep an eye out for something black and a little more light-weight. A faux leather version of my well-loved black moto jacket from Gap (I will be devastated when that dies). I'm only just over halfway through the book but already its been so helpful. I'm trying to psych myself up for a good closet clean-out. I have a ThredUp bag ready to go and normally I'm super gung-ho about purging but this time it's got me a bit anxious. There's so much in my closet right now that I used to love but isn't doing it for me anymore. It's like...getting rid of old friends, I guess. Are closet growing pains a thing? I think that's what I have. Does anyone else go through this closet cycle endlessly? Yay! I'm so glad it's been useful. 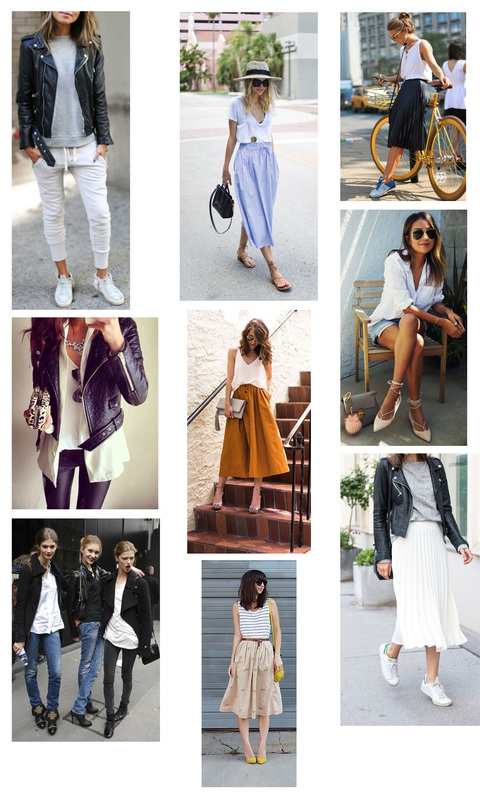 Also, all those inspiration pictures are making me think I might finally become a skirt wearer this summer. . . . I TOTALLY understand on having trouble getting rid of things you've loved in the past. I feel like my love should last forever? Which when I'm talking about clothes is a very strange thing to think. I realized that as soon as I wrote that. But yes, constantly going through my closet and I don't even have the pregnancy/body changing excuse! I go through phases with my closet, but I don't do very well at getting rid of things because, inevitably, as soon as it's out of the house I have the perfect outfit inspiration and it is now the only missing component. Sigh. I probably need that book too. I have heard nothing but awesome things about this book! I need to get it! My fear in life is being that mom that only wears Target tees and jeans--and I have become that. I really love skirts and dresses. I also watched the True Cost and have stopped buying from those big box stores, which makes it hard to find USA made clothes. I can sew and live under 2 hrs from LA fabric district so I need to carve time for sewing some feminine pieces!